*Note: The video at the end of this article contains some graphic content. View at your own discretion. During World War II, strategic bombings of Kassel, Germany resulted in the deaths of thousands of people over the course of about three years. On one night of bombings (with nearly 600 bombs dropped), some 10,000 people perished from the resulting fires and explosions, according to Online Military Education. Kassel was bombed many times over the course of three years. Many historians credit the Eight Air Force for a large part of the resulting victory over Germany. The unit took on daylight bombings (a huge risk, since they were much more visible) as well as other missions, according to Flying Magazine. Members of the United States Eight Air Force participated in bombings like this throughout the war. A new documentary based on the novel "Masters of the Air: American's Bomber Boys Who Fought the Air War Against Nazi Germany," by historian Donald Miller, will air as a miniseries entitled "The Mighty Eighth" on HBO. The show will chronicle the experience of soldiers riding in B17 planes during the war. In the clip at the end of the article, we watch a group of soldiers witnessing horror all around them. 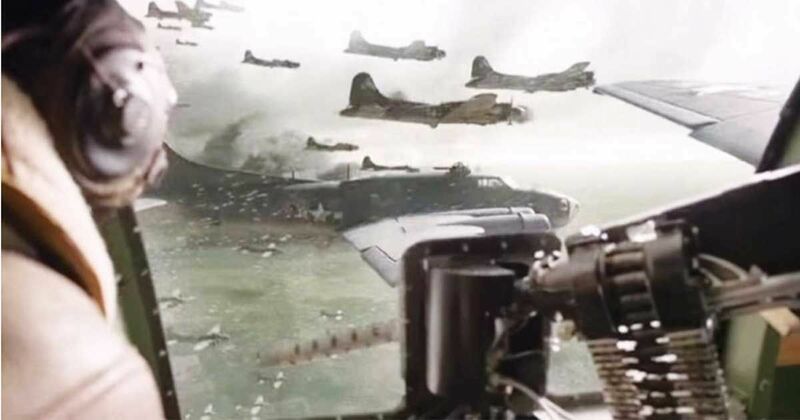 Planes are falling from the sky, engines are exploding ... and then a wave of enemy pilots appear in the distance. HBO Watch notes that this new miniseries is estimated to cost around $500 million. The film comes after the success of Band of Brothers (another miniseries based on a book by Miller) and The Pacific. Flying Magazine reports that the time put into the project total more than 60,000 man hours to date. Readers should note that production is still in development. No information about casting or release date has been announced, according to IMDB.